Medievalism in Australian Cultural Memory | The Cloisters, Perth, Western Australia. The Cloisters, Perth, Western Australia. An image of The Cloisters building in Perth. 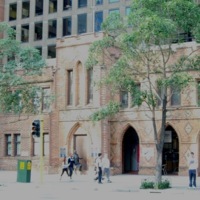 The brick building was designed by Richard Rosch Jewell for Perth’s first Anglican Bishop, Mathew Hale. It was built by convicts in 1858 as the colony’s first secondary school, the Perth Church of England Collegiate School. The building has Gothic and Victorian Tudor style features including crenellation, a central tower, blind arch, and Gothic arcading. “The Cloisters, Perth, Western Australia.,” Medievalism in Australian Cultural Memory, accessed April 25, 2019, http://ausmed.arts.uwa.edu.au/items/show/401.